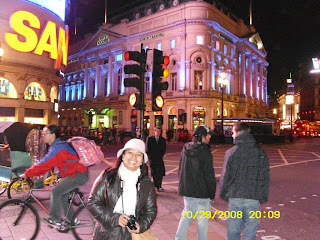 taken at Picadilly Circus, one of the famous and busiest street in London..cool place here!! love it!! appreciation to my friend Dae Loy for touring me here especially for clicking my camera!! HI guys and to all friends out there! please bear with me again. I can't visit you for now especially to all who leave messages and comments in my tagboard since I don't usually go online. I am just also borrowing the PC of my friend, Dae Loy here in UK..hope to visit you again once I will be back to Germany!! just saying Hi and hello to all!! enjoy your remaining weekend! !